Riverfront Theatre Company is excited to announce that we have just been given a wonderful opportunity to extend our reach within the community in a big way. Yesterday, Riverfront was the recipient of an utterly unexpected donation. There was a knock on our door, and Misty Habib of the former Theatre Windsor was there, holding a cheque. Theatre Windsor, who closed their doors permanently a little while back, had helped us before. They had loaned us some set pieces, and on closing, they were very generous in sharing both set pieces and a considerable amount of fabric for Riverfront to use. They have reached the final disbursement of their assets, and they selected us as a recipient of a donation. Our Management Committee knew instantly what we wanted to do with that money, because we had just been talking about what we would like to do. This timing was unbelievably perfect. Thanks to the kindness of our friends at the former Theatre Windsor, we are able to put into place the Riverfront Educational Initiative. 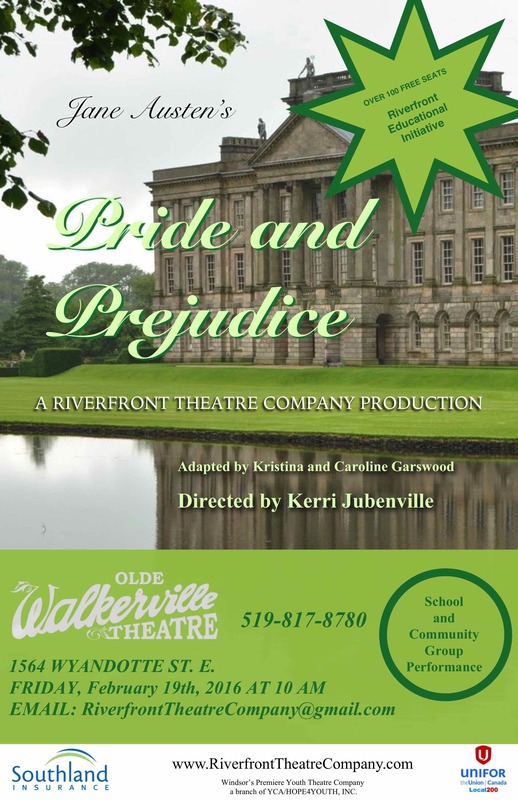 We are able to offer 100 free seats to our upcoming morning performance of Pride and Prejudice on Friday, February 19, to schools who would not normally be able to afford to attend the show, but are within walking distance and wouldn’t have to pay for a bus. We are also extending an invitation to area seniors. In less than 24 hours after extending the offer to these schools, our offer was accepted. And in fact, we’re going to have to top up those 100 seats with a few more out of our own pocket, but that’s okay – we’re excited to do that! It has always been a huge part of our mandate to make theatre affordable, not just for the children who participate in our programme, but also to those who would like to come see the show. By sponsoring the cost of tickets for some of our underprivileged schools in this community, and allowing us to extend invitations to some seniors as well, this generous donor has really helped us meet that important goal of providing live theatrical entertainment and removing any barriers in the way. We are so grateful to Theatre Windsor for making this possible, and excited to welcome our new audience members next month! Previous: Previous post: On this date in 1813….